Set the new source to use. Did the last call to GetEssenceData() return the end of a wrapping item. Is the last data read the start of an edit point? Get the edit rate of this wrapping of the essence. Get the current position in GetEditRate() sized edit units. Set a source type or parser specific option. Get BytesPerEditUnit if Constant, else 0. Can this stream provide indexing. Set the index manager to use for building index tables for this essence. Get the index manager sub-stream ID. Get the origin value to use for this essence specifically to take account of pre-charge. Get the range start position. Get the range end position. Ensure that CurrentSource is valid and ready for reading - if not select the next source file. 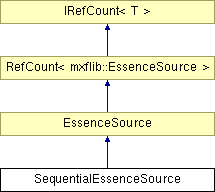 An EssenceSource for the current source file. The outer file parser which is owned by us to prevent it being released until be are done. The total size of all previously read essence sources for this set. List of all options set for this source. Essence Source that manages a sequence of essence sources from a list of file patterns.